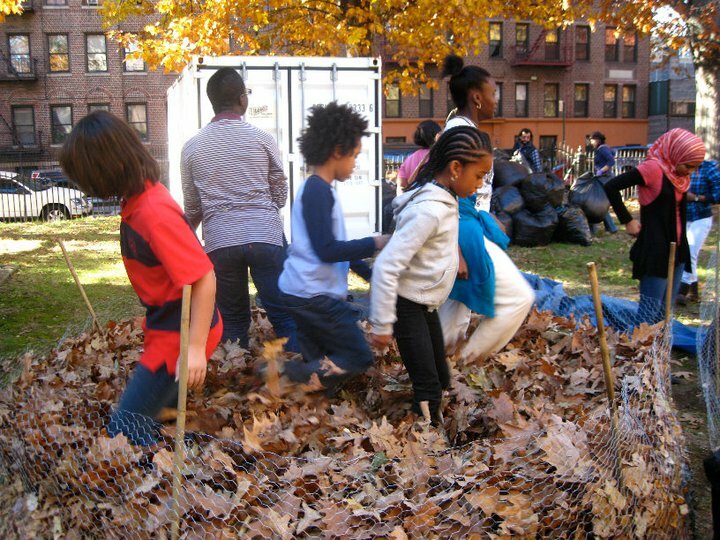 The Project LeafDrop that Sustainable Flatbush has held the past two Saturdays (November 6th and 13th) has been a great success! Thanks to all who participated, whether it was by volunteering or by contributing leaves, any help is much appreciated! We successfully constructed some chicken wire bins for the leaf composting to begin, and with the help of our handy volunteer stompers, we managed to compact a large amount of leaves from the church grounds into the bins. The final count of bags of leaves that people brought was 124! That’s 58 from the first Saturday and 66 from the second Saturday. On top of getting so many leaves for composting, we planted a lot of daffodil bulbs around the grounds of the Flatbush Reformed Church. Come spring, there will be a lovely display of daffodils lining the church grounds, and enough compost for the community garden!